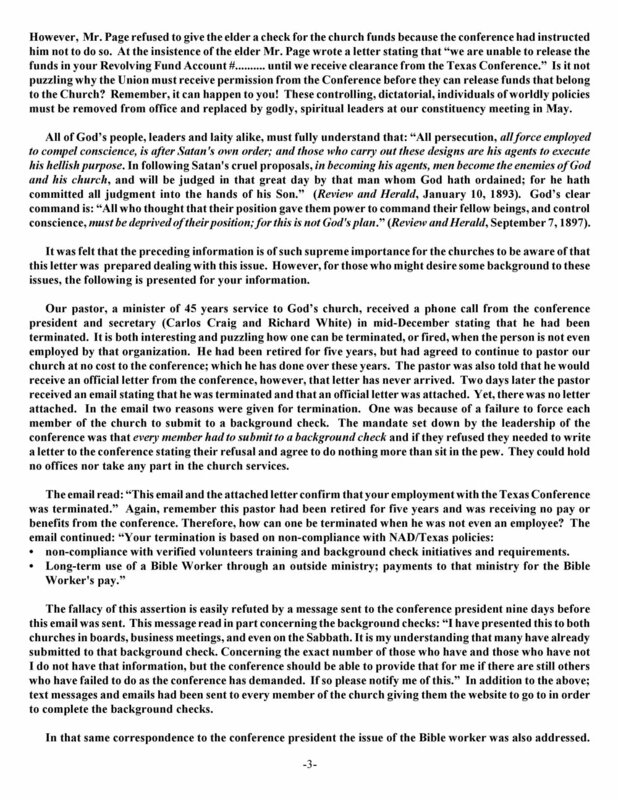 Twelve hundred constituents across the Texas Conference of Seventh-day Adventists recently received a six-page letter alleging conference misconduct and abuse of power. It described the closing and locking of the Fort Worth Northwest SDA Church, the Texas Conference’s seizure of church funds, and the termination of Pastor Joe Gresham. Gresham drafted the letter, at members' request, as a warning to others and a call to elect new leadership at the constituency meeting scheduled for May 19 in Bryan, Texas. The situation developed gradually during Gresham's 27 years at the Fort Worth Northwest SDA Church, in a district that usually also included the Weatherford SDA Church. In recent months it erupted, leaving the once-harmonious membership at odds with each other, with their long-time pastor, and with the Texas Conference. With the church’s doors locked, some members attend a church plant in nearby Saginaw, Texas. Another group worships with Pastor Joe. A few members attend elsewhere, but others stay home. The church building sits empty, an ominous sign on the door. Was it a theological Issue? What led to the closing of the Fort Worth Northwest Church? Pastor Gresham blames theological differences with the Texas Conference officers. He is a conservative, traditionalist Adventist pastor who believes strongly that the Textus Receptus that was translated into English for the Authorized Version of 1611 (KJV) are the pure Scriptures, whereas the Westcott & Hort critical text used in newer translations is a corrupted version. Gresham also supports the cluster of beliefs that have come to be called “Last Generation Theology” and opposes the “evangelical” gospel of cheap grace without obedience and overcoming. In 2002, the Weatherford SDA Church was removed from Pastor Gresham’s district, and his pay was cut in half. In 2010, Weatherford was returned to his district, but for some reason the conference kept Gresham on half pay. In 2013, the conference made Gresham retire, with the understanding that he would continue to pastor his district, and that he would be given a stipend for doing so. But the stipend never came through. When Pastor Gresham asked the conference about it, he was told that he had “misunderstood,” and there was never to be any stipend. Yet he continued to pastor the Fort Worth Northwest and Weatherford churches. In 2002, when Gresham was put on half pay while still an active full-time pastor, the Fort Worth Northwest Church created a “Special Fund” to supplement his salary, allotting him $1,000 per month, to be paid out of non-tithe funds. The local church treasurer sent the money to the conference, and the conference sent Gresham the monthly checks. “For 16 years Fort Worth Northwest has pitched in to cover the shortfall in my salary,” Gresham said. Over the years the “Special Fund” covered various expenses such as Pastor Joe's gasoline, a newer car, some house payments and home insurance, gifts to needy church members, etc. The board voted to approve many such disbursements over the years. Before talking to members, I found indicators that some were giving their tithe to the “Special Fund” rather than designating it as tithe and having it remitted to the conference. Monthly conference alignment charts for the past several years show that the Ft. Worth Northwest-Weatherford district tithes were significantly below average for the Fort Worth area, and for the whole conference. Moreover, in the three-year period from 2016 through 2018, membership in the district increased 9%, but tithe remittance to the conference decreased 4%. “Sister A” noted a change in church giving. Tithing through the conference dropped, while the Special Fund, and later a Bible Worker Fund, thrived. Benevolent projects and overseas missions—a sister church in the Philippines—were funded. Gresham regularly preached stewardship sermons, yet some felt he condoned tithing to the Special Fund. “In January,” Brother D continued, “the church voted a new board that [would have supported] Pastor Joe. The new board decided Pastor Joe should be able to get that money but he should be willing to give members [who objected to their money going to Gresham] a chance to get their money back during January. At this time, the previous treasurer was still in charge of the checkbook. At the end of January, she withdrew all the church money. She gave money back to some that gave to the Special Fund. Without notifying members, she wrote a check for the rest of the church money, some $72,000.00, to the Texas Conference, defying the local church board’s decision. The Ft. Worth Northwest Church had over $90,000.00 in the Southwestern Union’s Revolving Fund, a sort of bank where churches can deposit excess funds at interest which can then be loaned to other churches for special projects. 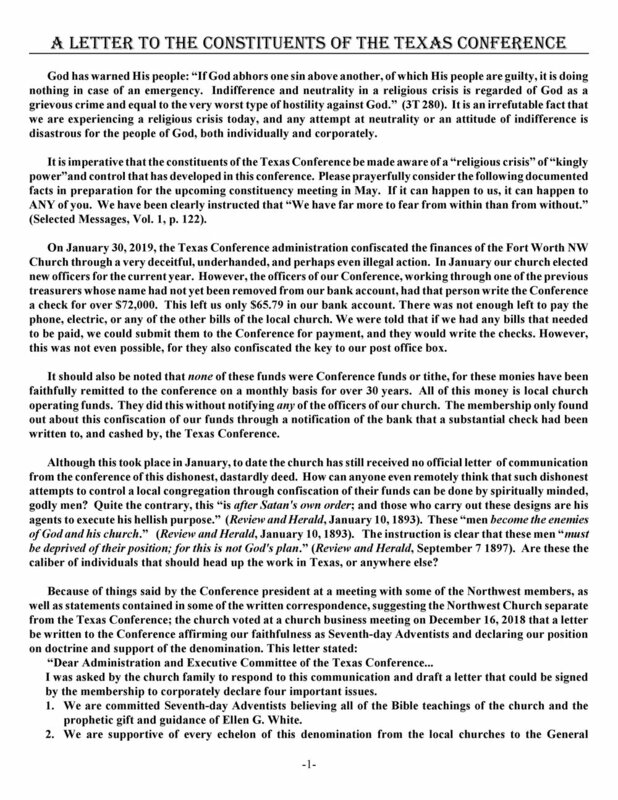 After the $72,000 in local church funds were sent to the conference, the church tried to withdraw its money from the Revolving Fund, and they were given a check for the full amount. 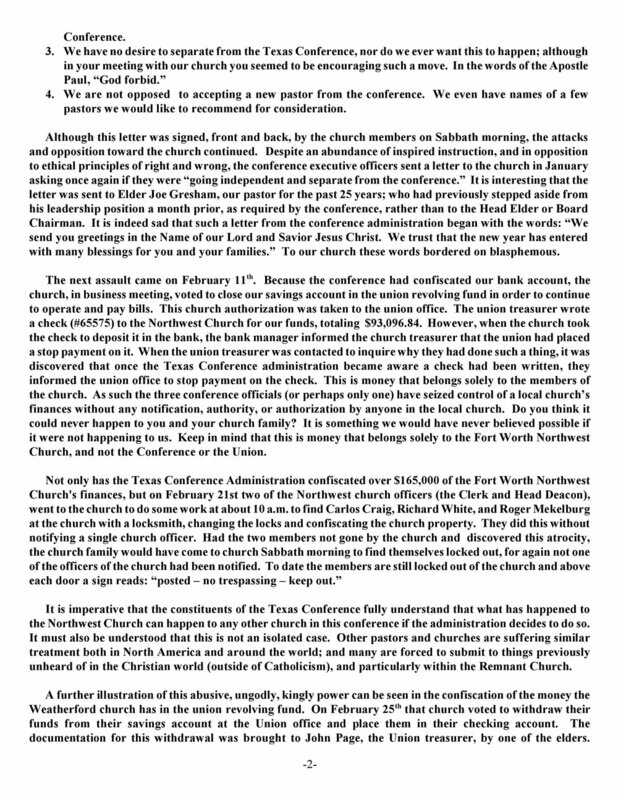 But the Southwestern Union stopped payment on the check before the Ft. Worth Northwest Church could realize the funds. “Pastor Joe should be reinstated. The conference should work things out, bring back Northwest, be willing to forgive. One wrong doesn't fix another wrong. There is pride on both sides. We know this man is not perfect...but you'll always find issues in a person wherever you go. The issue may be you! The devil wants us to think of men, but we are dealing with spiritual darkness forces here. Pastor Joe, or Family A or B, are not the bad guys,” Brother D affirmed. What is the root cause of Northwest's split? “It's pride and selfishness,” concluded Brother D. “pride and selfishness on all sides.” Brother D seeks to reconcile church members, pastor and conference. Gresham previously appealed to the Texas Conference and the nearby Southwest Union Conference, without success. North American Division Undersecretary Kioshan Ahn has agreed to intervene. Several church members, related on both sides of the conflict, have committed themselves to mediate and pull the others back into harmony. “My father's one goal is to get that church building opened back up, and to have us all worshipping there again,” said Brother E.
I saw that the remnant were not prepared for what is coming upon the earth. Stupidity, like lethargy, seemed to hang upon the minds of most of those who profess to believe that we are having the last message. My accompanying angel cried out with awful solemnity, “Get ready! get ready! get ready! for the fierce anger of the Lord is soon to come. His wrath is to be poured out, unmixed with mercy, and ye are not ready. Rend the heart, and not the garment. A great work must be done for the remnant. Many of them are dwelling upon little trials.” Said the angel, “Legions of evil angels are around you, and are trying to press in their awful darkness, that ye may be ensnared and taken. Ye suffer your minds to be diverted too readily from the work of preparation and the all-important truths for these last days. And ye dwell upon little trials and go into minute particulars of little difficulties to explain them to the satisfaction of this one or that.” Conversation has been protracted for hours between the parties concerned, and not only has their time been wasted, but the servants of God are held to listen to them, when the hearts of both parties are unsubdued by grace. If pride and selfishness were laid aside, five minutes would remove most difficulties. Angels have been grieved and God displeased by the hours which have been spent in justifying self. I saw that God will not bow down and listen to long justifications, and He does not want His servants to do so, and thus precious time be wasted that should be spent in showing transgressors the error of their ways and pulling souls out of the fire. Early Writings, page 119 (emphasis supplied). Conference officers, what is Christ's way to deal with a “difficult” pastor, who boldly preaches doctrines many have lightly regarded? What if he publishes your failings? What if you suspect he is bucking at your instructions? Do you terminate him? How, and for what cause? What are treasurers' and auditors' roles when a church's tithe falls off? How much do you investigate before drawing conclusions and taking action? Is it ever appropriate to change locks on a church without notifying those expecting to worship there next Sabbath? Do church splits make good church plants? Texas Conference Constituents, Do you nominate and elect leaders demonstrating faithfulness to Bible doctrines and the Spirit of Prophecy, or cultural and political conformity? Do you believe the Seventh-day Adventist Church Manual, voted by the world church in executive session, should be followed in your conference? How do you expect your conference officers to handle church conflicts? What does the “...hope and wholeness” motto mean in practice? “The greatest want of the world is the want of men—men who will not be bought or sold, men who in their inmost souls are true and honest, men who do not fear to call sin by its right name, men whose conscience is as true to duty as the needle to the pole, men who will stand for the right though the heavens fall,” Education, page 57. Pastors, what is the best way to work with your conference when you deplore its doctrinal drift, policies and practices? Is your faith in God's oversight of His remnant church evident in your sermons, your counsel and conduct, your board meetings? When members or conference officers offend you, how far do you follow Matthew 18 before you “tell it to the church?” How can you answer Jesus' prayer for church unity? Do you model the Seventh-day Adventist teachings you espouse? How should you respond if unfairly paid, terminated and treated? Church board members, what happens when the board votes against your opinions, your conscience? How should you address divisive church issues? Is majority vote enough, without first building consensus and addressing dissenting opinions? Is the pastor always right? Is he always wrong? When, why and how do you appeal to the conference for help? Church members, how do you respond when the nominating committee votes you in or out of a position? What should you do if you suspect a power play, or unfair voting? Are there any good reasons to stop attending church, or to stop speaking to fellow church members with whom you disagree? How does your understanding of present truth, the 1888 message of righteousness by faith and all other precious truths inform and guide your daily conduct? What witness do you bear within your family, your church, your community? Have you studied every Seventh-day Adventist doctrine for yourself, or do you rely on the pastor, fellow members or your own opinions for guidance? Preach the word...reprove, rebuke, exhort with all longsuffering and doctrine (2 Tim. 4:2). Bring ye all the tithes into the storehouse...(Mal 3:10). Let all things be done decently and in order (1 Cor. 14:40) . (2 Tim. 3:25) . . . Submitting yourselves one to another in the fear of God (Eph. 5:21). 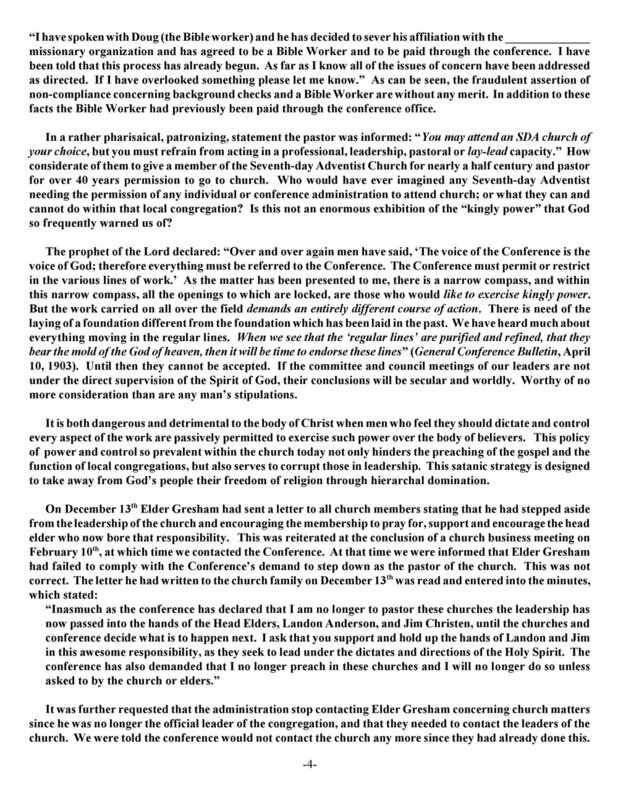 “We write today to inform you that Joe Gresham should not be allowed in any pulpits in churches, companies or groups within the Texas Conference. While we cannot go into detail, please be assured that this was a prayerful decision made with counsel. Holly Sue Miller Joers studied at Newbold College, Southern Adventist University, and Weimar College. She is married to Skip Joers and writes from Clinton, Arkansas.